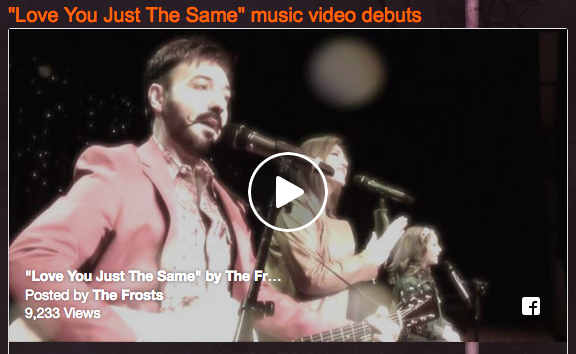 The Frosts​ (formerly The Michael Frost Trio) are excited to announce the release of their very first concept music video, "Love You Just the Same," also a forthcoming radio single. The video made its debut on social media outlets on July 5, and will make its television debut on an upcoming episode of “Gospel Music Today” with Ken Grady. The video, shot at God and Country Theatre in Branson, MO, features the husband and wife team of Michael and Jen Frost, along with their daughter Jael, who make up the family group. “Love You Just the Same,” written by Michael, was well-suited for a concept video as the concert footage is interwoven with powerful images, he explained. The video coincides with an upcoming radio release through Mansion Entertainment with additional promotions by Richard Hyssong. The Frosts are also in the planning stages of an upcoming album, also to be released with Mansion Records, featuring all-new material written by Michael. As a songwriter, Michael has written for many of the country’s top artists, including The McKameys, Ivan Parker, The Dixie Melody Boys, The Hyssongs, and many more. The video can be viewed above, on The Frosts Facebook page here: https://www.facebook.com/themichaelfrosttrio/videos/1646925885379472/ , and also on their website, www.themichaelfrosttrio.com.